Hostile Situation. Copyright 2002 Wilkins Peak Productions. The poster below is the teaser and main poster. 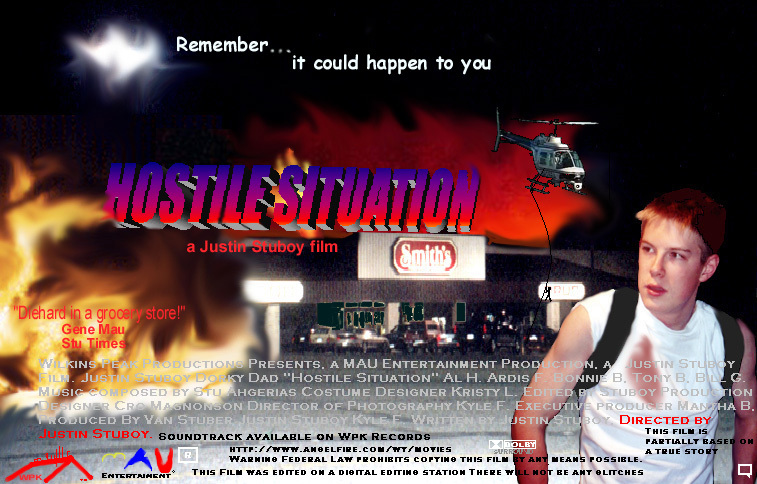 Hostile Situation was written to be partially based on a true story. The whole beginning of this film did in fact really happen. In the beginning of the summer of 2002 a hostage situation occured in western Green River Wyoming. (heres the fake part) Pretty soon this situation got to the point where it was mobile, and the man holding his family hostage called some of his friends and they moved to hold a nearby grocery store hostage. Eventually one of the employees is shot for not opening the safe containing the stores daily input This sparks mass caos in the store and the enemy is still heavily armed. Its up to one of the employees to save the customers and his fellow employees before all hell breaks loose. Gene Mau of the Stu Times said "It's Diehard in a Grocery Store." Plenty of action and adventure add to make this great good vs. evil flick. Color 2002 Wilkins Peak Production. Rated (R) for violence and language. This review by: Freddie Farz Jr.